Saigon, Nha Trang, Hoi An, Hanoi — there is a well worn backpacker circuit through Vietnam of its famous cities, but there are also scores of places just off the beaten track that are worth visiting in Vietnam too. Don Morgan gives his top 10 favourite places to visit in Vietnam. I’ve spent the past year in Vietnam, writing and researching for the website Travelfish. My travels have been pretty extensive, though I still haven’t been everywhere (at least not yet). What follows are the places I’m always telling people to go. You’ll notice that Mui Ne, Nha Trang, Sapa, et al, don’t make the list. Fine places all, but they are standard, over-visited, tourist destinations. My constant litany to my fellow-travellers is, “Get off the tourist trail!” What follows are the places you’ll be missing out on unless you make an effort to seek them out. This is a completely subjective, personally biased accounting of my peak experiences on the road. This might seem like an unlikely candidate for a top-ten list, but much to my surprise, it was one of the most interesting things I saw in Vietnam. The museum was planned in 1977 right after the American War ended, with the assistance of the Soviet Government. Construction didn’t being until 1985 and wasn’t completed until 1990, when it opened on the centenary of Uncle Ho’s birth. I expected a dry presentation of the ‘man on the money’ through photos, documents, and artefacts from his life, and the first gallery was much like that. But the upper gallery was mind-boggling. It was conceived as a series of post-modernist art installations along eight themes, in the tradition of the radical, ‘experiential’ art of the 1970s. Some of the exhibits are incomprehensible. Others, like an all-white Edsel emerging from a wall, or a tilted table bearing a monumental pineapple and bananas, don’t seem to have anything to do with Ho Chi Minh at all – but the Edsel symbolizes America’s failure during the war, and the pineapple symbolizes – well, it symbolizes fruit. Other exhibits, like a rendering of the cave HCM sheltered in during the war as a human brain, are downright kooky. Even if you’re bored by museums, definitely check this out while you’re in Hanoi. It’s startling how many people skip over Da Nang. The fact is, it has one of the most beautiful beaches in the world, fantastic seafood, and great attractions in the surrounding area. It was a prime R&R spot for Americans during the war, and returnees say that China Beach is every bit as beautiful now as it was then, and a heck of a lot safer. Nowadays, everyone seems to head straight to Hoi An to get a suit made, without giving Da Nang a second thought. True, it isn’t as tourist-friendly as some other destinations, and it’s in a strange state of transition while a whole slew of luxury resorts are being built along the beach. But I had the time of my life here. Surrounding attractions include a trip up Ba Na Mountain Hill Station, a motorbike trip along the along the crest of Monkey Mountain on the Son Tra Peninsula, a day trip to Lang Co beach to the north, and the most touristy attraction, Marble Mountain, is popular for a reason–it’s amazingly beautiful and unique. There are some great options for eating, drinking, and dancing, and the beach is a Mecca for surfers from all over the world, especially in winter. It takes some effort to get the most out of Da Nang – the best places are hidden away and spread out all over town – but it’s definitely worth the effort. Everyone heads to Ha Long Bay, and that’s fine – it’s great, people enjoy it, heck even I enjoyed it and I had to do it four times for a feature story I was writing. But savvy travellers are booking tours Bai Tu Long just to the north – it has much the same geography as Ha Long, but it’s relatively free of tourists. If you don’t fancy being crammed into a boat with thirty other people, queuing up to walk through caves, and being dogged by vendors in boats every step of the way, a trip to Bai Tu Long could be just the ticket. 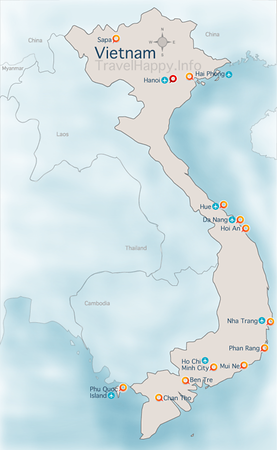 Trips include overnights on islands like Van Don and Quan Lan, which offer good alternatives to the obligatory stay on Cat Ba, which isn’t all that great really. The area north of Nha Trang between Ninh Hoa and Tuy Hoa, is one place I’m dying to go back and explore some more. Highway 1 is usually a pretty dismal road, but this stretch of it is stunningly picturesque, and the southern approach to Tuy Hoa is not to be missed, with stops to gawk in wonder at Vung Ro Bay and from the top of Da Bia Mountain. To the south is the Hon Gai Peninsula–take a look at a map to get a sense of how much unexplored territory there is there–it’s really an island connected to the land by a sand bar. The sand dunes here are two stories high and there are so many miles of gorgeous, deserted beaches, most of them don’t even have names. The best place to base yourself is Dai Lanh beach – the accommodation here isn’t great and there’s little tourist infrastructure, but hey, that’s why the area is an undiscovered gem. You’ll need to acquire independent transport to see the area properly. Visitors to Hue may feel they have their hands full with the cultural attractions there, but I always advise them to pull themselves away and get their asses to Bach Ma Mountain, at least for an overnight. A perilous road leads up this ridiculously high mountain, and the atmosphere at the top is as serene and rarefied as anything I’ve experienced in Southeast Asia. The views are panoramic in good whether, and when it gets cold, the mountain is shrouded in a mysterious, perpetual mist that is an experience in itself. Of course there’s a ton of wildlife (most of which you won’t catch a glimpse of) and insects the size of your head (which you may not want to catch a glimpse of). There are miles of hiking trails leading to some breath-taking waterfalls, especially the one at the end of Rhododendron Trail. It helps to be fairly fit and nimble of foot to traverse some of the best trails, but the other highlight of my trip was simply hanging out with the Vietnamese tour groups at the top. Something about being in such a remote place brings people together in a temporary, ad hoc community. We broke out guitars, drank wine, and sang songs late into the night. It’s 45 km south of Hue, and it’s very easy to arrange a tour there, or go on your own. Hoi An itself is oozing with culture, there are good, nearby beaches, and the ancient Cham city of Son My attracts steady crowds. 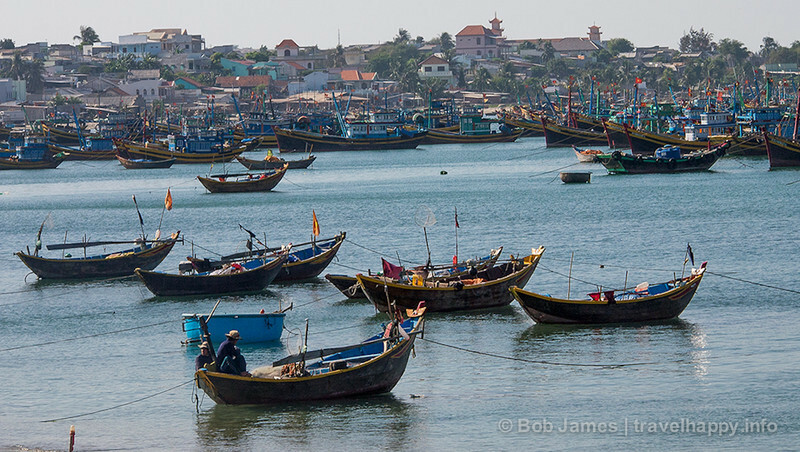 All well and good, but next time I visit Hoi An, I’m heading back out to Cham Island. It’s an hour off shore by boat (unreachable in winter due to high seas). There’s a coral reef right along the shore, teeming with colourful fish, that makes for great scuba and snorkelling. The tiny fishing village on the island is about as local and authentic and experience of Vietnam as you’re likely to get. You can spend the night camping on the beach, or stay at the island’s sole guesthouse. Electricity comes from generators, and only in the early evenings, so the rest of the time you’ll live by candle light and be surrounded by peace and quiet, and the sound of the waves. I’m jonesing to see it again just writing about it. Quang Ngai isn’t much of a town, but the museum commemorating the My Lai Massacre just outside the city is all the reason you need to go there. The massacre took place in 1968 and was carried out by American soldiers against the inhabitants, mostly women and children, of several small hamlets, just a couple of kilometres from the beach. The museum will teach you all about the brutal slaughter of up to 500 innocents, as well as the heroic efforts of an American corpsman to put an end to it. The museum itself is excellent, vividly telling the tale in horrifying detail. If this doesn’t give you a lump in your throat, outside, the village itself has been preserved as a part of the museum. The houses have been left as they are–burnt to the ground, but for one that has been reconstructed to show what life was like before the attack on the village. What got me was seeing the ditch, featured in so many photos of the event, where the victims were dumped after being executed. It’s now a peaceful little brook. Be prepared–many a grown man has broken down in tears during a visit here–including this one. It’s not an easy experience, but if you haven’t visited My Son, in my opinion, you haven’t visited Vietnam. Kon what? Look for it on the map–it’s just northeast of Kon Tum. Rarely visited by foreigners, it’s a frontier-style town atop a kilometre-high mountain. The trip up and down by motorbike is simply mind-blowing. There are decent guesthouses at the top, and cool whether in the summer. There isn’t a heck of a lot to do up there, except hang out with the locals living and working up there, but that’s what I like about it. There’s an attempt underway to make it a retreat, and the area hosts a good bit of forestry and logging, but it’s still one of the most memorable and isolated spots I’ve been to in Vietnam. Because I’m becoming a minor authority on the subject, people are always asking me, “What’s the one thing I should do while I’m in Vietnam?” I only have one answer–take an Easy Rider Tour. These tours can be arranged in Hanoi, Hue, Danang, Hoi An, Da Lat, Nha Trang and Saigon. You can roll your own itinerary, but the main route is through the Highlands to the west of the country, not far from the Laos border. This is the corridor known as the Ho Chi Minh Trail, the major supply route for the Viet Cong during the war. There’s an excellent paved highway, technically route 14 for most of the length, which is named after the trail. The trip will treat you to remote mountain villages, breathtaking vistas, and soul-stirring natural beauty. The standard rate is 50 USD per day for a driver, not including your own meals and lodging. Expensive, but worth every penny. The driver straps your stuff to the bike, and you ride on the back. I did it on my own motorbike, which, if you can manage it, is an ideal way to go. I send people off on this trip all the time, and they always e-mail me at the end to rave about it. And if you happen to do any of the above – whether you want to thank me or curse me for giving you the bum steer – definitely do the same. For more info on how to visit the above sites, check out www.travelfish.org.